On Wednesday, God suspended Satan indefinitely from his role as Devil for promising demons as much as 10,000 dollars for each soul they lured into temptation. Satan’s two head assistants, a gargoyle named Thoth and former American President Ronald Reagan, received slightly lighter suspensions of up to 5000 years, but may be reinstated earlier if they successfully complete anger management classes. When confronted with this statement, Satan didn’t hesitate to fire back. “Wait, so I’m getting scolded about morality by the guy was responsible for the extinction of nearly the entire populations of Sodom and Gomorrah. This is the same God who, on a bet, let me destroy the life of one of his most committed servants, Job. You’ll excuse me; I have to go throw up,” sneered Satan as he spat upon the ground. 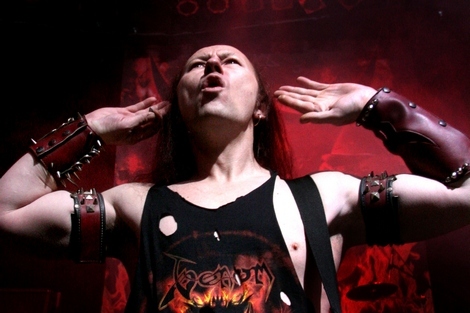 In Satan’s absence, Venom frontman Cronos has been named Interim Dark Lord until Satan’s reinstatement. Cronos is a veteran of the dark arts having served in Satan’s Army since 1981. Cronos even had brief experience running Hell back in 1986 when Satan broke five of his legs in a terrible water skiing accident. Cronos has many exciting new plans he has considered for Hell including an open mic night, the addition of all-you-can sin brothels and building a stadium in an attempt to lure the Buffalo Bills to Hell, giving the Underworld its first pro sports team since the 1976 Oakland Raiders. Experts believe that Cronos is a good fit for the position and could bring untold glory to Hell. However, many fans were disappointed when their first choice, former Giants and Jets coach Bill Parcells, turned the job down. While Parcells was a flashier name, those around the game respect Cronos for his undying commitment to poisoning the human race with heavy metal and believe that he will be the perfect choice to get Hell back on track. This entry was posted on April 19, 2012, 3:35 PM and is filed under General Weirdness. You can follow any responses to this entry through RSS 2.0. You can leave a response, or trackback from your own site. Lay down you soul to the Gods Rock and Roll!!!! You guys are so weird. Keep up the good work. Uh, won’t this interfere with his duties as Royal Uncle?